This is the wackiest thing I've seen on the web in a long time. Okay, maybe less wacky and more cool. 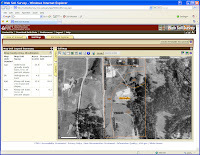 It is a web based soil survey where you can enter in your property parcel number or address and it tells you what kind of soil you have, plus you can tell how much sun exposure is there and things like power lines based on aerial photographs. So, if you are in the market for a new house and want to know your gardening or farming prospects at the site, this is a fabulous resource. It is run by the USDA Natural Resources Conservation Service. It doesn't have complete coverage (my city address didn't turn up any soil info), but it's great for more suburban and rural areas. For example, I entered in the address of one of my favorite U-Pick farms and got the report shown above (click on image to view the bigger version). If you live in Snohomish County in Washington State, they have their own site, Focus on Farming Map, which is more comprehensive.